Prelubricated Bearings handle oscillating movements. Series DS(TM) bearings eliminate fretting corrosion damage to shafts under low-amplitude oscillating movements. Bearings feature rigid steel backing to which is bonded porous bronze sinter layer, impregnated with filled acetal polymer bearing lining. Bearings withstand max static specific load of 16,000 psi. Max recommended sliding speed is 5 fps dry, 8 fps greased, and 33 fps with marginal lubrication. Operating temperature range is -76 to +266Â°F. Thorofare, N.J., February 7, 2003 -- Glacier Garlock Bearings (GGB) now offers its DS(TM) bearings to eliminate fretting corrosion damage to shafts under low-amplitude oscillating movements. Designed for both marginally lubricated and dry applications, the bearings are available as cylindrical bushings, thrust washers, strip and custom parts. The DS material structure features a rigid steel backing to which is bonded a porous bronze sinter layer impregnated with a filled acetal polymer bearing lining. DS bearings are especially well suited for automotive applications, such as steering gears, power steering, pedal bushings, seat slides, king-pin bushings, tail gate pivots, brake caliper bushings and others. Typical industrial applications include mechanical handling and lifting equipment, machine slides, hydraulic cylinders, hydraulic motors, ski lifts, pneumatic equipment, medical equipment, textile machinery, agricultural equipment and scientific equipment. The bearings can withstand a maximum static specific load (p) of 16,000 psi (110 MPa) and a maximum dynamic load of 6,500 psi (45 MPa). Maximum recommended sliding speed (U) is 5 fps (1.5 m/s) dry; 8 fps (2.5 m/s) greased; and 33 fps (10 m/s) with marginal lubrication. Maximum recommended pU factor is 40,000 psi x fpm (1.4 MPa x m/s) dry; 80,000 psi x fpm (2.8 MPa x m/s) greased; and 285,000 psi x fpm (10 MPa x m/s) with marginal lubrication. Operating temperature range is -76oF - +266 oF (-60oC - +130 oC). Coefficient of friction (f) is 0.15-0.30 dry; 0.05-0.10 greased; and 0.03-0.08 with marginal lubrication. The recommended shaft surface finish Ra is less then or equal to 0.04 µm. The recommended shaft hardness is >200 HB and preferably >350 HB for a service life >2,000 hours. GGB is the global leader in high-duty polymer-based bearings, which include its well known DU and DX steel-backed polymer products. It is headquartered in Heilbronn, Germany, and has manufacturing plants in the U.S., France, Germany, Slovakia and Brazil. The company serves more than 50,000 customers worldwide through 22 operating units in 17 countries. GGB supplies the industrial and automotive markets with more than 20,000 different cylindrical and flanged bushes and thrust washers from a portfolio of pre-lubricated and self-lubricating plain bearing materials. In addition to these standard offerings, the company can produce special bearings to customer requirements. Applications include automotive shock absorbers, oil rigs, ski lifts, cranes, off-road vehicles, swivel chairs, aircraft fuel pumps, power generation equipment, machine tools and many others. GGB also offers bearings and components and made from injection-molded thermoplastics, filament-wound composites, reinforced thermosets, bi-metals, metal + solid lubricant and sintered materials. 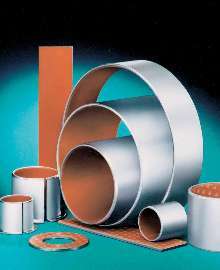 GGB is an operation of EnPro Industries, Inc., a leader in, metal-polymer bearings, sealing products, compressor systems and other engineered products for use in critical applications by industries worldwide.